Dead Bars premiered a new track over at Stereogum last week. The track is called "Pink Drink" and it will be released on their upcoming new record titled Regulars. Regulars is due out May 3, 2019 on A-F Records. See below to check out the new track. The Flatliners frontman Chris Cresswell released a track titled "To The Wind". The track is the first taste of new music with a full band backing of new music. Chris Cresswell will be playing a few acoustic dates this spring and summer. See below to listen to the new track. German skatepunk band Primetime Failure released a new track off of their upcoming new album. The track is called "Apologies, I Have Some", see below. The track will be released on Memory Lane, the album will be out on May 10th, 2019 through Uncle M, Disconnect Disconnect Records, Shields Recordings, Hectic Society Records, Trilob Records, and Melodic Punk Style. 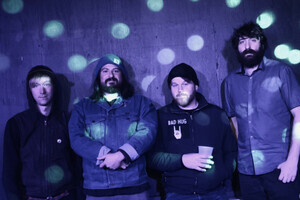 Chicago based punks Kali Masi shared a cover of Adrianne Lenker "Blue & Red Horses" though a benefit compilation for Brandon Michael Lee and his family. The compilation is put together to help raise money for unexpected heart surgery and hospital stay that Lee had earlier this year, tracks on the comp unreleased or cover songs from acts like Pet Symmetry, Dowsing, Max Stern and much more. You can see below to listen to the cover or click here to listen/download the entire album. Montreal based Ska band The Planet Smashers released the first taste of music from their upcoming new album. The track is called "Can't Stop" and it will be on their new album titled Too Much Information. Too Much Information is out on May 10th, 2019 through Stomp Records. See below. Big Nothing released the first single off of their upcoming full-length record. The track is called "Real Name". The record is titled Chris and is due out May 10, 2019 through Salinas Records. Big Nothing contains members of Spraynard, Casual, Crybaby, and Young Livers. See below to listen to the track and to view the full details on the record. We're thrilled today to bring you more weird and wild sound from Montreal art-punk duo CRABE. The band's gearing up to release their 7th record, Notre-Dame de la vie intérieure, this spring on Pantoum Records. Today we're sharing the new video for the riffy and raucous "Le monde entier." It's the third recent single the band's shared in recent months, following "Festival" and "Livre compliqué." London reggae ska-core band The Skints released a new single over at Substream. "Restless" is the third single off of the band's upcoming album, Swimming Lessons. Swimming Lessons and is due out May 10, 2019 You can click here to stream the new track via Substream. Virginia based Americana-punk Mike Frazier released a new single titled "Stay The Same". The track is off of his sophmore LP, Where The Valley Kissed The Sky. Where The Valley Kissed The Sky is due out on May 31st, 2019 through Geneva Records. Mike Frazier is the former front man of the pop-punk band Random Holiday. See below to listen to the track and to view his upcoming tour dates. Noise-punk band Florida Man premiered the first track off of their upcoming sophmore full-length over at Decibel. The track is called "Brain Cell" and it will be available on Tropical Depression. The album will be out on May 3rd, 2019 through Spartan Records. See below to check out "Brain Cell". The band will also be heading out on a East Coast run of shows this June, see below for the dates. Canadian punks The Penske File premiered a music video for their track "Spin My History" over at Exclaim. The track comes from their latest effort Salvation . The band will be heading on a UK and a Northeast US run of dates this spring.